Imagination and creativity are wonderful things for all ages – not just children, as society is fond of trying to convince everyone. Thankfully, trends such as adult coloring books and the resurgence of artisan crafts have proven that adults want and need to be creative too. It’s a proven tool for stress management, adding a sense of fulfillment into everyday life, and even for addiction recovery. Polymer clay is another part of that “crafty” resurgence, with Sculpey III leading the pack for easily accessible, high-quality clay that everyone can enjoy. It has bright colors and a great consistency, so it’s often the first step beginners take into the wonderful world of polyclay, and many – including quite a few professionals – stick with the brand for life. What Can You Do with Sculpey III Polymer Clay? No, clay art is not the amateurish “summer camp” art many people think it is. It can be for kids too, and it can be fun and simple if you want, but it is a very diverse medium that allows you to create virtually any color or texture you like. Of all the clays I’ve tried, Sculpey III is my favorite for everything except lifelike sculpture. For sculpture, I currently use Sculpey Premo!, but plan on eventually upgrading to a true sculpture clay eventually. Sculpey III colors blend beautifully, so you can create custom colors for any imaginable project. The regular full-sized blocks are scored so that they’re easy to break into four identical pieces, which is very useful for blending. I keep notes on my own custom colors, and these scoring marks make it really easy to mix up small batches and maintain exact proportions. There are any number of books on creating with polymer clay, many of which I’ll link here once the reviews are posted. They include instructions for sculpture, faux textures and surfaces, and how to finish your clay for glass-like surfaces, among other things. If you’re looking for amazing pearly or color-changing effects, I highly recommend blending these with Ranger pearl powders. How Much Does Sculpey III Cost? Sculpey ranges in price from about $1 to $3 per 2-ounce block, depending on where you get it from and what kind of quantities you buy. My Sculpey III collection currently consists of at least one block – but often three or four blocks – of every color they make. Bear in mind that this kind of collection can get expensive, since they do make dozens of colors. 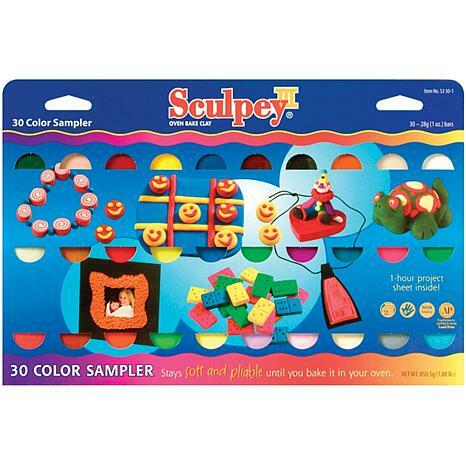 If you’re just starting with limited funds, or if you’re not sure if polymer clay is the right craft for you, the Sculpey III sampler packs are the way to go. Each is a collection of popular colors in 1-ounce blocks or 2-ounce blocks, and some include specialty types such as glow-in-the-dark or eraser clay. Since Sculpey III blends beautifully, you won’t really miss anything if you can’t afford the entire available palette right away. How Easy is Sculpey III to Use? The one hard and fast rule about using Sculpey – or any polymer clay, for that matter – is you have to have clean hands. Like really clean hands, because any little speck of dust, loose skin or hair will get into your piece. Work the piece you want to use with your hands until it is warm and pliable. Create, then bake at 265 degrees Fahrenheit for 20 minutes. Simple. It’ll still be slightly soft while it’s still hot, so don’t overcook it. Any equipment you use for clay should be for only clay. This prevents cross-contamination of the clay, and also keeps you from, say, eating bits of clay the next time you use that dish that doubled for clay baking. Other very helpful things include a pasta roller, razor blades, a rotary tool such as the Dremel 4000, latex gloves and a toaster oven if you plan to bake a lot of clay. Toaster ovens can be surprisingly cheap, especially if you buy secondhand – I got mine for free from a local lady who’d upgraded, and now it has probably baked over 100lbs of clay all told. After baking, thoroughly sand down and polish each piece. If desired, add an air-drying glaze such as Sculpey Glaze or DecoArt’s Triple Thick to seal it. Clean-up is really simple and easy, though you may find some colors on your hands if you don’t use latex gloves. The worst for color transfer are dark greens, blues and vivid reds, but they come off relatively easily with warm water and soap. Overall, polymer clay is the most addictive craft I’ve found except for my bead-weaving and beaded micro-macrame. I’m constantly adding more supplies to my collection as I learn new techniques and explore the wide range of possibilities, and I can’t help adding blocks of Sculpey III at any chance. The cost isn’t much on a small scale, and only gets expensive when you’re creating multi-block canes on a daily basis (yes, I’m guilty) and dedicating many hours of polishing and finishing.